We Service Escondido, North County, Valley Center & You! 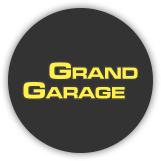 At Grand Garage, conveniently located at 1556 E. Grand Ave., Escondido, CA 92027, we are here to TAKE CARE OF YOU and all your auto repair needs! Come visit us, and take advantage of our superior customer service. Family owned and operated since 1992, we offer same day service on most repairs, as well as complimentary 51-point vehicle inspections. 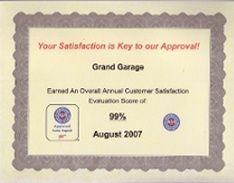 Our ASE Certified technicians have the skill and expertise to get our customers' auto repair and maintenance done right the first time. We use all-new parts that are factory standard or better to complete all our auto repair and maintenance jobs, and specialize in factory scheduled maintenance, auto diagnostics, and repair services for a variety of domestic and foreign vehicles, as well as RVs. Unlike most auto repair shops that only offer warranties on parts or labor, our 24 month/24,000 mile warranty covers most parts and labor! Customers can enjoy a clean, comfortable waiting room and free Wi-Fi while they wait for their vehicles. Free local shuttle rides to and from your home or place of work are also available. Give us a call today! We'd love to hear from you. Visit us in Escondido Ca, for a variety of auto repair and auto maintenance, including auto diagnostics. Our auto repair shop specializes in factory-scheduled maintenance, including fluid flush services. We recommend transmission, power steering, coolant, and brake fluid flushes at least every 2 years. We perform this service by hooking your vehicle up to a machine that pumps new fluid in and thoroughly flushes old fluid out. We also provide all types of auto maintenance (except smog testing), including oil changes, cabin air filters, PCV valves, and complete tune-ups. Our ASE™ certified technicians can perform superior computer diagnostics on most cars. We complete our diagnostics by hooking your vehicle up to a machine, which then runs through an on-board diagnostic database and searches for issues and problems throughout the vehicle. 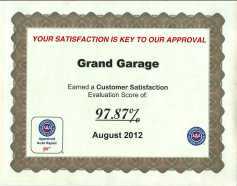 In need of auto repair and excellent customer service? 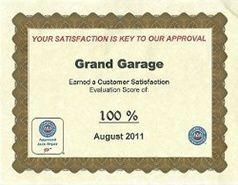 Grand Garage can help! Our highly skilled technicians will assess your repair needs, explain your repair options, and get you and your vehicle back on the road in a timely fashion. "I could not be happier with their service. new radiator, fluid changes, timing belt, water pump... All affordable, and fast turn around." "Five stars all the way David at the front desk was extremely helpful and informative! I will definitely becoming back for my next round of upkeep." "Great work, won't go anywhere else!"